So 700 people showed up to see Richard Gage and David Ray Griffin, and the response from the university is to try to change the rules so that 9/11 Truthers can't rent university rooms for their events. Administrators at the University of Quebec in Montreal (UQÀM) say they will develop a formal policy for outside groups renting campus space for events after a controversial lecture about 9/11 drew fire by academic staff. But the French-language university defended its right to have contentious speakers lecture on campus as part of free speech, saying it was appropriate to debate ideas, as long as events don't incite riots. The Monday night lecture, hosted by World for 9/11 Truth, drew about 700 people who came to hear from two U.S. academics who deny the Sept. 11, 2001, attacks were carried out by terrorists. The researchers – David Ray Griffin and Richard Gage – believe the U.S. government played a major role in orchestrating the deadly attacks on New York City's Twin Towers and the Pentagon in Washington, D.C.
Griffin and Gage are lobbying for an independent inquiry into the attacks, which killed 3,000 people. Their theories – part of the self-titled Truthers movement that formed after Sept. 11 – have been repeatedly discounted by scientists and civil engineering experts. Griffin is giving a second lecture on the same topic at UQÀM on Tuesday night. Some professors at the school argue conspiracy theories have no place at UQÀM. Three Canadian universities will be used as venues for a speaking tour by prominent 9/11 skeptics. Americans Richard Gage and David Ray Griffin dispute the conventional wisdom that foreign terrorists linked to al-Qaida brought down the Twin Towers on Sept. 11, 2001. They will give lectures at the University of Toronto, Carleton University and the University of Quebec in Montreal over the coming days. Faculty members at the Montreal university told a city newspaper they are upset the institution is being used for the event. One says it harms the school's credibility. This tour comes right on the heels of a free-speech controversy that erupted when US pundit Ann Coulter had an appearance cancelled at the University of Ottawa. Part two on the Bush protest saga. Jaggi Singh, anarchist media darling calls 9/11 truthers crazy and anti-semitic at the protest for George W. Bush's visit to Montreal. Associates of Jaggi Singh assault and threaten to kill the truthers. Montreal 9/11 Truth attempted to find out why Jaggi and his friends had so much hostility to 9/11 Truth. Chris Selley: Canada's first truther mayor? Earlier this month, Union Montréal — mayor Gérald Trembaly's party — put out a press release of the "Top 10 statements made by Richard Bergeron, Party Leader of Projet Montréal," and would-be successor to Mr. Tremblay. The number-one statement involved Mr. Bergeron not being totally convinced man ever walked on the moon. The number two and three statements involve his not being totally convinced the 9/11 attacks weren't "a simple act of state banditry of titanic proportions." I'll concede it's tough to rank the lunacy of these two propositions, but I think I'd have reversed them. As Michèle Ouimet notes in an astonishing interview/article in La Presse, Mr. Bergeron suggested in 2005 that the plane crashes at the Pentagon and in Pennsylvania were nothing but "a macabre farce" — a pretext to "seize, once and for all, all the oil reserves in the Persian Gulf." Thousands of 9/11 truth activists from around the world will be gathering this long September 11th weekend in protest to the official 9/11 narrative being espoused by the U.S. government, its allies and the mainstream media. Many family members of 9/11 victims are demanding a new and independent inquiry due to the 9/11 Commisions failure in answering over 80% of their questions. Following the recent scientific research from an eight member team headed by Dr. Niels Harrit, Associate Professor at the Department of Chemistry, University of Copenhagen, having found Active Thermitic Material in the Dust (explosives) from the the World Trade Center Towers, an ever increasing amount of experts from military, goverment, heads of state, intelligence, engineers, and more are currently denouncing the official narrative from the U.S. government. 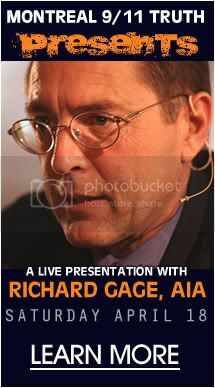 L'architecte Richard Gage donnera une conférence à Montréal ce samedi soir. Prix à l'entrée: 10$ afin de nous aider à couvrir les frais d'administration. La conférence sera donnée en anglais et présidée par le professeur Michel Chossudovsky, érudit de renommée mondiale, chercheur, auteur et directeur du Centre de recherche sur la mondialisation. Pour réserver, envoyez-nous svp un courriel à reservations@mtl911truth.org en précisant le nombre de participants. De nombreuses personnes ont déjà réservé leur place. Parmi elles se retrouvent des architectes et ingénieurs, des pompiers, des représentants municipaux et provinciaux, et des journalistes. L'espace est limité. Afin de s'assurer l'accès à un siège, nous vous recommandons de réserver à l'avance. James Bamford's dubious sense of irony when it comes to Israeli firms cornering the market on NSA's major "mass surveillance"
AMY GOODMAN: You say that they set up their final base of operations almost next door to the NSA headquarters in Laurel, Maryland? Vancouver BC – What started out as a simple petition, has turned into a lot more. The Vancouver 9/11 Truth Society is proud to announce the launch of the 2008 Truth Tour, set for August 29th – September 15th, 2008. On August 29th, a busload of hard working and dedicated Vancouver 9/11 Truth activists will begin their trip across the country to meet up with their counterparts in Eastern Canada, and join them in Montreal for the March on Ottawa that will be commencing Sept 7th. During their 8 day trip across the country, they will be stopping in various cities along the way to give away free DVD’s, educate people about the flaws of the 9/11 Commission Report, continue to collect signatures and show the country that 9/11 Truth will not quit – not until this war is over, and not until Canadian troops are back home. The last major remnant of Saddam Hussein's nuclear program, a huge stockpile of concentrated natural uranium, reached Montreal on Saturday to complete a top-secret U.S. operation. The removal of 550 metric tonnes of "yellowcake," the seed material for higher-grade nuclear enrichment, included a two-week airlift from Baghdad and a voyage across two oceans. The Iraqi government sold the yellowcake to a Canadian uranium producer, Cameco Corp., in a transaction the official described as worth "tens of millions of dollars." A Cameco spokesman, Lyle Krahn, said the yellowcake will be processed at facilities in Ontario for use in energy-producing reactors. "We are pleased … that we have taken (the yellowcake) from a volatile region into a stable area to produce clean electricity," Krahn said. U.S. and Iraqi forces have guarded the 9,300-hectare yellowcake site since its discovery. I pray to god nothing happens to my city that I love so much. However, if anything does happen and I survive, I pledge not to believe any story they give me about Al Qaeda or Iran and I will fight until my last breath to make sure we get a full independent investigation into the event.